The show wether competition is increasing every year as children and young adults are discovering that goats are an excellent choice as a show project. The main reason for this growing enthusiasm I believe is due to goats are small, easy to work with, and demand a small amount of space. This, in itself, makes selecting the optimal wether most important. One point of interest that we have noticed is that some breeders will price the what they consider the top half of their show goats at one price then the price decreases as the quality of the wether decreases. These same breeders will then reprice all the wethers after they have sold their top half and will increase the price of the lower quality ones stating that the lower quality are now worth the same price as the top half that have already sold. Please beaware of this practice. There are excellent wethers out there that are reasonably priced and a lot of breeders will price all their wethers at one price no matter what the quality then it is up to the person buying to pick what they believe is the best. Prices normally range from 150.00 to upwards of 600.00. There are several good wether sales which top wethers have sold in the $2500.00 to $6000.00 range. Please remember if the high priced wethers don't make the major sales then at terminal shows you will only get whatever the yard price is. First you will need to determine which shows you want to attend. You will need to read the general rules and regulations as well as special rules governing the shows you plan to attend. These rules will tell you the number of wethers you may enter, weight limits, ownership dates and entry deadlines. Show schedules, rules and regulations may be obtained from your county Extension agent, FFA Instructor, or directly from the shows. Show dates are extremely important because they determine the age and size or weight of the wether to be entered, and at what time of year they should be purchased. Most shows require that wethers have their milk teeth, therefore you need to know when your goat was born and how old the wether will be at show time. Goats usually hold their milk teeth until they are 10 to 12 months of age. After this time, it is probable that a goat will lose its baby teeth and become ineligible for major shows and some organizational shows such as the Texas Junior Livestock Association. Most wether shows have weight limit requirements that must be met. Under normal conditions, wethers will gain approximately 2 to 3 pounds per week. Not all wethers can be fed to the same final weight because there are differences in frame size (bone structure, height, length, and depth). A Large frame wether may be correctly finished at 120 pounds, while a small frame wether may be correctly finished at 80 pounds. You must learn to look at indicators of frame size and growth (length of head, neck, cannon bone and body) and determine at what weight the wether will be correctly finished. If you know the approximate weight of the wether at the time of purchase and the length of time until a show, you can calculate feed requirements (light, moderate or heavy) needed to enable that wether to enter the show at its correct weight. Remember that size does not make a good wether. It also is important to be aware of fat thickness. Young wethers that are bloomy and fat always look good, while young, thin wethers do not look as nice. Learn to look past fat and recognize muscle so that you can pick a genetically superior wether. When purchasing a wether, it is important to know some information about the producer. Do not hesitate to ask questions about the goats bloodline, age, vaccinations it has received, when are the vaccination boosters due, what type of feed they feeding, any illnesses the wether has had since birth. The selection of a wether for your project is one of the most important decisions you will make. The type of goat you select will have a major influence on the projects results. Remember that a winning wether is a combination of good selection, good nutritional management, proper grooming and outstanding showmanship. People differ in their ability to select animals. Some have a natural eye for selecting young animals of high caliber, while others never develop this ability. Do not hesitate to ask for help from someone with these skills such as your county Extension agent, Future Farmers of America instructor, parent or another leader in the county. Many breeders are also willing to assist you in your selection. Consider the following when selecting a goat: structural correctness, muscle, volume and capacity, style and balance, and growth potential. Structural correctness refers to the skeletal system or bone structure of an animal. A wether should hold its head erect and the neck should extend out of the top of the shoulders. The wether should travel and stand wide and straight on both front and rear legs, and the legs should be placed squarely under the body. Look for a wether with a strong level top, and a long rump with a slight slope from hooks to pins. Your wether should be heavy boned and be strong on its pasterns. 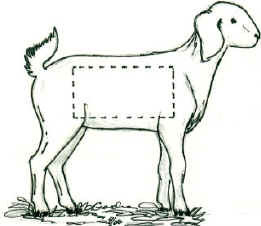 Open-shouldered, weak-topped, weak-pasterned, steep-rumped goats should be avoided. Generally, a wether that walks and stands wide is going to be heavier muscled. The wether should have a deep, heavily muscled leg and rump. When viewed from behind, the widest part of the leg should be the stifle area. The wether should have a broad, thick back and loin that is naturally firm and hard handling. A good wether should be wide through its chest floor, with bold shoulders and a prominent forearm muscle. The chest and forearm are the best indicators of muscling in thin wethers. This refers to the relationship of body length to body depth and body width. Wethers should be long bodied, with adequate depth and spring of rib. Avoid selecting wethers that are short bodied, shallow bodied, narrow based and flat ribbed. Style and balance refer to the way all body parts blend together, how the neck blends into the shoulder, the shoulder into the rib cage, the rib cage into the loin, the loin into the rump, and how eye-appealing a goat is. When viewed from the side, a wether should have a smooth shoulder, level top, trim middle and straight legs. A wether that is balanced, pretty and holds up its head is the first one you notice when you walk in the pen. The ability of an animal to grow rapidly is very important. Generally, a larger framed goat that shows a long neck and body, thick cannon bones, and set wide between the eyes, will grow faster, be larger and be more competitive in the show ring. I would like to thank Dr. Toby L. Lepley for allowing us to use information from Texas Agricultural Extension Service & Agricultural Communications, The Texas A&M University System. Disclaimer: Reference to commercial products or trade names is made with the understanding that no discrimination is intended and no endorsement is implied. Note these pages are protected under copyright. Do not use graphics or statements from these pages without express written permission from the web page author.